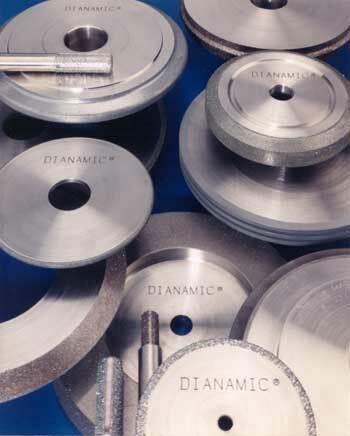 Founded in January 1985, DIANAMIC ® Abrasive Products Inc. is a manufacturer of Single Layer Superabrasives and Bonded Diamond and cBN Grinding Wheels and Tooling. From the original 300 square foot one man shop, the company has grown to occupy 13,000 square feet of manufacturing and office space. Beginning with one local customer in 1985 DIANAMIC serves customers on five continents with technological developments that meets their continually changing needs. Grinding wheels with a wide range of applications including the manufacture carbide inserts for the petroleum industry. Related services and products include inspection mylars for profile grinding. Replacement wheels for bowling ball resurfacing for HAUS and COOK machines. Also special diamond tipped drills for extend life of hole drills. For steel and aluminum cores supplied by customers. Special emergency services available. DIANAMIC® Abrasive Products, Inc. All rights reserved.